A blistering 10 minute first half period saw the unstoppable train that is Luton's home form just keep on rolling against Bradford this evening. James Justin and Elliot Lee's double did the damage, as Town put the game to bed in a scintillating spell that made it five League One wins in a row at Kenilworth Road, and eight from 10 this term, taking 26 points from a possible 30. The hosts named an unchanged side for the fourth successive game, although Danny Hylton, free from suspension, was back on the bench. A desperately quiet opening saw Town create the first noteworthy opportunity, as another now trademark intricate passing move saw Pelly-Ruddock Mpanzu find Lee who shot over from the edge of the box on 11 minutes. It took Luton a good quarter of an hour to fashion another chance worth mentioning, Glen Rea's effort from range easy for O'Donnell. However, the keeper didn't cover himself in glory on 28 minutes, as Luton had the lead when Harry Cornick's curler should have been comfortably held. O'Donnell spilled it though and Justin of all people was on hand to pick up the rebound, finding the roof of the net. Lee then almost had an immediate second, a lovely move slicing the visitors open, and from Mpanzu's pass inside, this time O'Donnell did cling on. The game then exploded into life for 10 minutes, as City almost found a leveller, when Matty Pearson produced a superb sliding challenge on Eoin Doyle and James Collins cleared off his own line. Town keeper James Shea was almost left red faced when the ball slipped out of his grasp, but Doyle didn't quite notice in time and Luton's number one escaped any further embarrassment. Fresh from the let off, Luton went straight up the other end and had a second on 33 minutes, as Mpanzu found the onrushing Lee and he steadied himself before clinically finding the bottom corner. As is their way, Hatters then put the game to bed just give minutes later, Cornick's simply outrageous outside of the boot flick finding Lee and he beat the wrongfooted O'Donnell for a 10th of the season. After the break, the visitors had the ball in the net on 52 minutes when Doyle met a corner and David Ball turned home from on the line, only to be adjudged offside. Shea flipped Kelvin Mellor's speculative effort over the top as City finally came into the game, especially when bringing on Jack Payne. Lee almost had his treble, his flick cleared away from the line, while Shea then had to gather Payne's low effort. 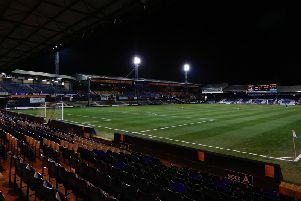 Luton had a fourth with just two minutes to go, when Ryan McGowan made a hash of a throw, Cornick sped away and although O'Donnell half saved, Town's speedster was able to bundle the loose ball over the line. Sub Aaron Jarvis almost bagged his first league goal, denied by O'Donnell, but Luton climbed up to third in the table ahead of their FA Cup trip to Bury this weekend. Hatters: James Shea, Jack Stacey, James Justin, Matty Pearson, Sonny Bradley, Glen Rea (C), Pelly-Ruddock Mpanzu, Andrew Shinnie, Elliot Lee (Dan Potts 83), James Collins (Aaron Jarvis 88), Harry Cornick (Jorge Grant 89). Subs not used: Marek Stech, Alan Sheehan, Lloyd Jones, Danny Hylton. City: Richard O'Donnell, Adam Chicksen, Ryan McGowan, Eoin Doyle (C George Miller 75), Kelvin Mellor, Kai Brunker (Jim O'Brien 46), Connor Wood (Jack Payne 53), Paul Caddis, Lewis O'Brien, David Ball, Karl Henry. Subs not used: Ben Wilson, Daniel Devine, Thomas Isherwood, Luca Colville. Booked: O'Donnell 33, Payne 90.